200g small roma or cherry tomatoes, halved. Place potatoes in a saucepan and cover with water. Add a pinch of salt, cover and bring to the boil. Cook for 10 – 20 minutes until cooked (but be careful not to overcook or they will fall apart in the salad). Timing will depend on how large your potatoes are. Season the lamb with salt and pepper. Heat 1 tablespoon of oil in a frypan on a medium high heat. When hot, add lamb and cook for 2-3 minutes per side or until cooked to your liking. Transfer to a plate and rest for 3-5 minutes. Cover with foil to keep warm. Once rested and ready to serve, slice . To make the salsa verde, place all the ingredients in a small food processor (I used the attachment on my stick blender) and process until you have the desired consistency (it can be almost a puree or quite chunky, it’s up to you). You could also do this by hand if you prefer (I haven’t tried, but I assume you could chop the herbs by hand, blend the anchovies, capers and garlic in a mortar and pestle and then mix in the liquids and herbs). Taste and season as needed. 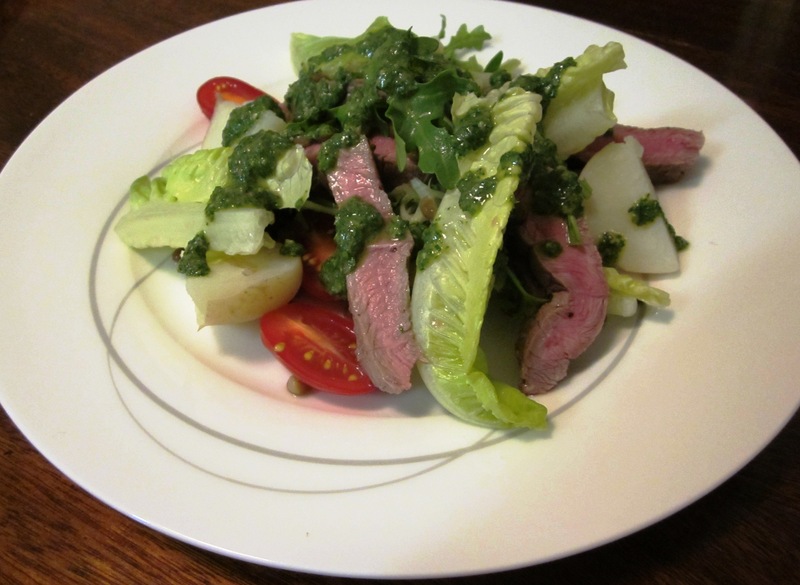 Arrange the salad ingredients however you like and drizzle over the salsa verde. Serve on its own or with crusty bread, which is good to mop up the leftovers. It’s also great the next day as a cold salad. If you try it and don’t like it with the lentils, you could probably replace them with quinoa.